So, I had a great time at the Springfield show, and had somebody stop by to tell me they enjoy my "occasional" blog. So I figured I ought to actually post something. And no, I don't intend this to be a one-time thing! I have actually gotten a few things done in the basement, and have a few projects in the works. Actually, when I think about it, there is probably quite a bit to report on. So I'll get to that shortly. In the meantime, here's a classic Kent Cochrane photo. This shot of I-2 class #1300 with an 8-car racing special is facing eastbound on an unknown date c1946/7. Note the large wrench leaning against the line pole. I still need to pick one up. The shot offers a pretty good view of Siderowf Paper Company in the background. 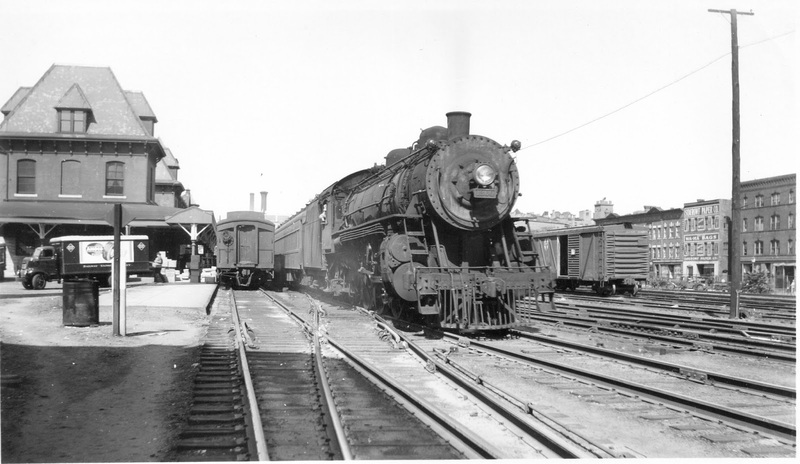 The baggage car is being loaded with (storage) mail and will go to Hartford on Train #463. Also of note is an ATSF Bx-11 box car, #124518. 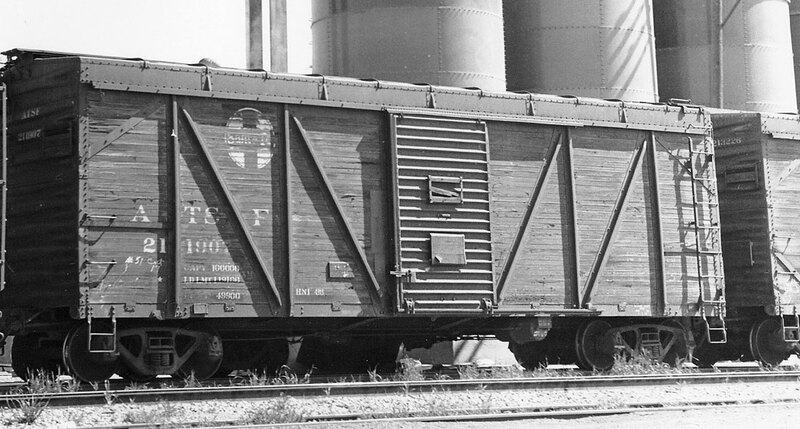 The original Bx-11 box cars had radial roofs, but this is clearly a peaked roof. From 1941 to 1944 they were being rebuilt with Murphy roofs, many raised by a foot which is quite obvious as seen in a photo on the Proto48 Modeler site. This car received a more modest 6" increase in height. A Westerfield #4600-series kit will be my starting point for this, with a new roof. Other details are the speed limit sign (we see the back) and just in front of that is the back of the ring post, similar to a whistle post but with an "R" instead of a "W."
The rodding that parallels the track in the foreground runs under the track just in front of the locomotive and continues alongside it to the switch mechanism. I don't have a good picture of the end roughly where Kent would have been standing. My assumption is that it is some sort of locking or switching mechanism for the crossover, since Kent is standing on what is the Berlin Line, and the locomotive is on the eastbound main, Track #2. There is no evidence, nor any notation on the valuation maps that there is a derail here. I don't know if a hand-thrown crossover could use rodding to throw the other end of the crossover, but I suspect not. To start with, it would have to actuate the hand throw at the other end. Instead, I suspect it was a locking mechanism since throwing this crossover fouls the mainline. However, if there were locks at both ends, then I'm not sure exactly how that would work either. Perhaps somebody can shed some light on this? Can't shed any light on the rodding/locks/etc, but wanted to be sure to let you know how AWESOME it is that you're back to posting! I know you're life is especially busy, but even just a simple, quick post "unpacking" such a great photo is YUGE! As you know, I love getting as far into an image as possible, and your deep knowledge of all this stuff really makes Cochrane's effort come to life. Looking forward to more posts!